For my whole entire life, I have been disgruntled with my flat, lifeless hair. Seriously. Then along came the "thinning shears", which helped a bit. My hair would bounce for a few weeks, before falling back into it's flat state again. Humidity makes it especially challenging, as I often end up with "helmet hair" (a term developed by my very creative son). I know my curly-headed friends have their own problems, but how I have wished for curly hair many a time! And then something changed. About a year ago, I went on Pinterest and saw a recipe for a shampoo bar. It looked like a bar of soap but it was for your hair. I pinned it and didn't think a whole lot more about it. I have never taken the time to make it to this day. 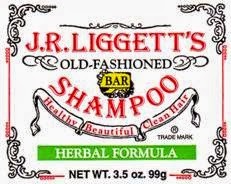 But when, a few months ago, I was ordering a few other things, I happened upon J.R. Liggett's Herbal Shampoo Bar and decided to give it a try. Pinterest had made me curious. Could a bar of shampoo actually work? I had been reading about the unnecessary (and possibly dangerous) fillers in shampoo and had been looking for a different option. It arrived and I started using it. It felt very different than regular shampoo as I scrubbed it into my hair. It gave a nice lather, but it made my hair feel different. I wasn't sure what that meant. Well, I found out what it meant. As I dried my hair that first time, I was pleasantly surprised with how good it looked. As the day went on, it continued to look pretty good. Hmm. I kind of figured it was a fluke. But then, as day after day passed, my hair continued to style easily and consistently stayed full of body throughout the whole day. In fact, I am a day away from my hair appointment and my hair still looks good. It is like a miracle. I have spent years trying to wait out haircuts--even buying my own thinning shears and thinning it so that I could make it a full six weeks between haircuts. After a few weeks, I told my mom to give it a try. She, too, has struggled with her hair. She called me up and told me that it worked great for her, too, and that she had even had a couple of compliments on her hair! I am not sure what this shampoo would work like for my curly-headed or long-haired friends. But if you are someone who has short hair without a lot of body, I would highly, highly recommend this bar . Oh, that's so good to know. I wondered about how it would work on hair with lots of body. It is a little more expensive, but when you consider what you pay for "good" salon shampoo and how long it lasts, the cost seems reasonable. I'd still like to try to make my own sometime, but this one works so well, I am a little scared to try! Olive oil, coconut oil, castor oil, spring water, sodium hydroxide (lye) and essential oils for fragrance. I make my own bar shampoo and liquid shampoo. Yeah, I agree. Thanks for the encouragement :) I definitely plan on trying it sometime. I have a busy couple of months coming up but am hoping to experiment some when the new year comes! Thank you for sharing this. I've been using a cleansing conditioner for the past few years because I don't like what shampoo does to my hair. But it is very expensive and these are lean times. I've just popped a bar of J.R. Liggett's into my amazon cart. Can't wait to try it! Cool We may have to give this a try. Thank you so much for sharing this with us at the HomeAcre Hop. We'd love to have you back again this morning.